I'm writing this to share my excitement about (and hopefully help drum up an audience for) a short tour I've organised later this month. Tobias Delius is one of my very favourite saxophonists, and I'm delighted to be playing in a trio with him and the great drummer Mark Sanders. Toby is probably best known as a member of the incredible Dutch big band the ICP Orchestra. Their five night Vortex residency in January (reviewed here ) was a highlight of the year for me, and hopefully plenty of other readers of this website. He also leads his own quartet (featuring Han Bennink, Tristan Honisinger and Joe Williamson), and was a member of the great Louis Moholo-Moholo band, 'Viva la Black', joining him in Moholo's South African tour in 1993 after 10 years exile under apartheid. I'm a huge fan of Toby's playing. 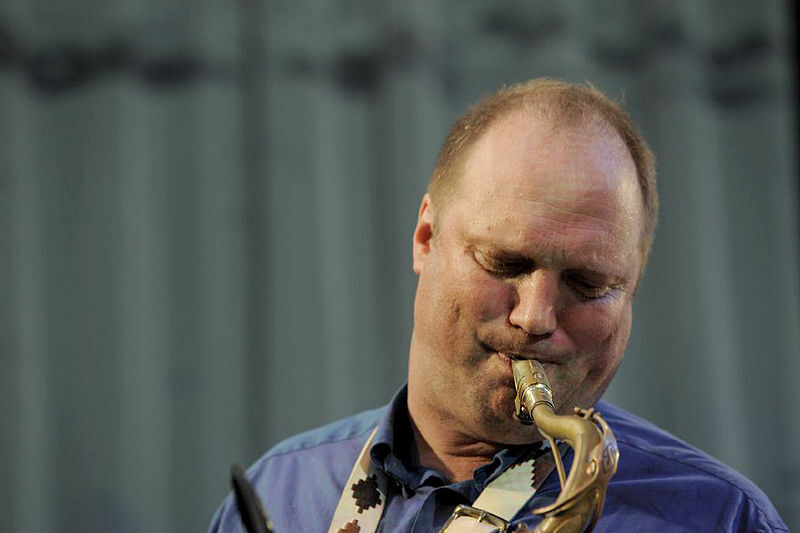 He combines a massive, warm sound and a melodic style rooted in the great jazz tenor tradition, with a completely flexible and free approach to improvised interaction. Reviewers often describe his style as combining the sounds of Ben Webster, Sonny Rollins and Archie Shepp, and while he's completely his own man there's something to the comparison. Olie Brice: I know you were born in England, and lived here as a child. Have you worked here much as a musician? Or done much with English musicians? Toby Delius: I didn't start hooking up with English musicians till I was in Amsterdam in the late 80s. Since then there have been many get-togethers over the years, in Holland, England and elsewhere... Except for the ICP week in the Vortex last January I haven't played in the UK for ages. I'm really looking forward to this tour. OB: The recent ICP residency at the Vortex seemed like a really special occasion to me, and several people I've spoken to. Did it feel that way to you? TD: It certainly was special for me and I believe it was so for all of us. It's always great for that band (for any band in fact) to be able to play in the same place for a few nights, especially when there are so many old and new friends around, some of whom we got a chance to play with. OB: Could you tell us a bit about playing in Louis Moholo's 'Viva la Black', and especially about the experience of touring South Africa with him? TD: When Louis asked me to join his band for the South African tour I was thrilled. I had played with Louis a couple of times in Sean Bergin's projects and really loved it. To go on the road with him and play night after night was like a dream. And of course the tour celebrated the end of apartheid. Hope and optimism everywhere, even though we also did witness many ugly remnants of the old days. OB: Have you worked with Mark Sanders before? How about the guests we'll be playing with on the tour - Paul Dunmall, Miles Levin and Dave Birchall? Olie Brice: What other projects have you been involved with recently? Anything coming up you'd like to tell us about? Toby Delius: I am enjoying very much playing with all kinds new projects, exciting times. I do wish there would be more opportunities to perform with the bands that have been developing for 20 years and more, like my quartet with Tristan Honsinger, Joe Williamson and Tristan Honsinger, 'Booklet' with Joe and Steve Heather or the duo with pianist Michiel Scheen.